Four Easy Actions to take NOW to help Get Out the Vote in Kingfield! Sign up to be a KFNA Get-Out-The-Vote Block or Building Captain! 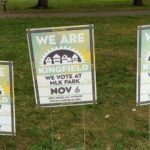 All Kingfield neighbors vote in a single location and Kingfield’s Polling Parties are the largest celebration of community and civic responsibility that KFNA organizes all year. Once again as a “thank you” for voting, we will provide free, hot coffee and tasty treats to all Kingfield neighbors, all day long, as they come to cast their ballots in precincts 8-6 & 8-7 at MLK Park! Volunteer to be a part of it! Greet your neighbors, hand out delicious homemade treats as well as ones donated by our many fabulous restaurants including: Butter Bakery Café, Sun Street Breads, Victor’s 1959 Café, andThe Lowbrow! Share this Polling Party event on Facebook so all your friends see it and remember to vote! Better yet, Join the event and INVITE your friends to it!! Even better yet, make a plan to meet your friends at MLK Park for coffee and voting at a specific time!!! Together we can Get Out the Vote!